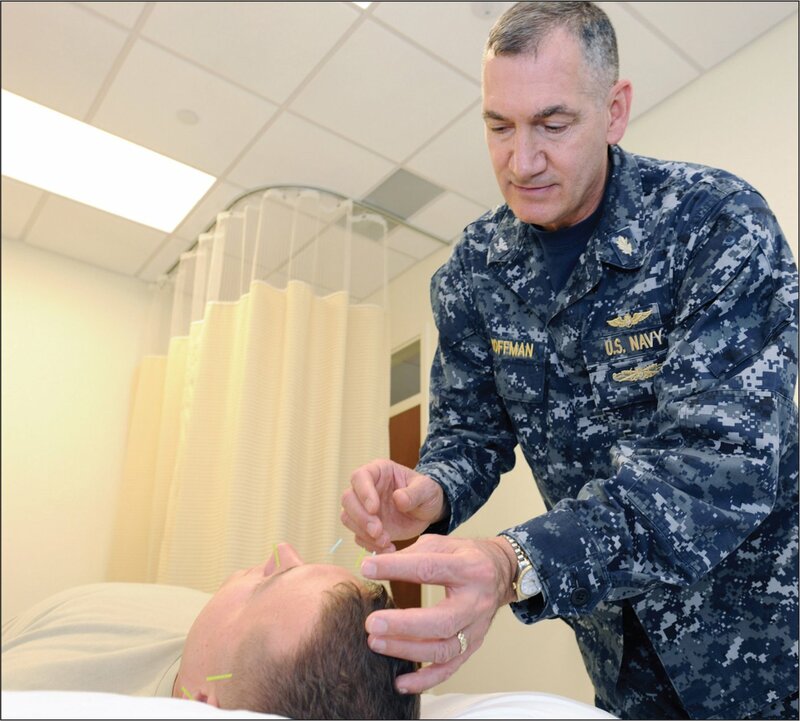 Approximately 250 military physicians have undergone comprehensive training programs in medical acupuncture since 2009 when the US Air Force, Navy, and Army began sponsoring active duty military physicians. The goal of the training is to provide the techniques of this emerging discipline as primary or complementary treatments for the 3 major problems areas from the last decade of warfare: acute and chronic pain, acute and chronic stress disorders, and sequelae to concussion. Definitive exposure-based therapies may be indicated but are not feasible logistically and are often temporally difficult to deliver. As challenges to provide useful therapeutic strategies to deployed troops limit classical interventions, integrative medicine offers the hope of providing more choices and with those options, the sense of empowerment over one’s own recovery. Robert L. Koffman, MD, MPH, inserting acupuncture needles into a soldier at the National Intrepid Center of Excellence in Bethesda, Maryland. Image courtesy of National Intrepid Center of Excellence. Post-course surveys reveal that physician graduates of this program use their new skills as frequently for stress symptoms (anger, anxiety, insomnia, agitation, fear, concentration difficulties) as for “kit neck” and “kit back,” the persistent cervical and lumbar musculoskel-etal problems caused by wearing heavy protective gear and carrying weapons. Medical acupuncture, or the use of thin needles placed in proximity of tiny neurovascular bundles, releases a cascade of neurotransmitters that affect pain modulation and facilitate better functioning. Because musculoskeletal problems are common in this patient population, most pain problems respond to needles inserted over or surrounding contracted, inflamed, or traumatized muscles. Such local treatments are then reinforced with needles placed distant to the site that regulate the autonomic activity for that region. Treatments for acute pain are repeated as frequently as necessary until resolution allows the patient to return to duty. A common Chinese practice performed widely by acupuncturists involves a four-needle formula called “Four Gates,” so named because 4 needles placed distally in both the upper and lower extremities has been shown to stimulate all 12 of the energy, or “qi,” meridians. With the addition of 2 mid-line points on the head, this technique can rapidly create a calming and centering effect in psychologically traumatized service members. The lead author of this paper has used this combination of needles in the war theater in a multitude of tactical settings, both inside and away from the Battalion Aid Station (BAS), including the interior of tactical vehicles, passenger terminals, even “fighting holes” (fox holes). The initial players in the neurophysiology of stress are the medial temporal structures of the hippocampus and the amygdala. An analogy for how the 2 areas work would be that the hippocampus is the “librarian” in the neocortical “library” where life experiences are stored. The prefrontal cortex, which normally down regulates the medial temporal structures, is functionally deficient in PTSD. The hippocampus processes memory, and in executing this function, recruits the amygdala to create behaviors that allow the psyche to maintain a defensive distance from small or large traumas. The hippocampus and amygdala are involved in memory consolidation where memory can be modulated. Auricular acupuncture has shown itself to be effective in relieving acute and chronic pain symptoms and may be applied either as an isolated treatment or as a complement to needling the soma. Because of its innervation and vascular supply, the external auricle maps a homunculus (see Figure), a pictorial representation of an inverted body. Analogous to cortical homunculus wherein a “little man” depicts the motor and somatosensory cortex, the auricular homunculus on which all body parts are represented, are either endodermal, mesodermal, or ectodermal in origin. Scanning the ear with a smooth, rounded probe or with a battery-operated resistance measuring device identifies zones that correspond to traumatized areas on the body. Needling these zones on the ear modulates the afferent nociceptive impulses traveling to the brain and, consequently, reduces the experience of pain. The needling appears to assist in repairing the target tissue as well. Figure. 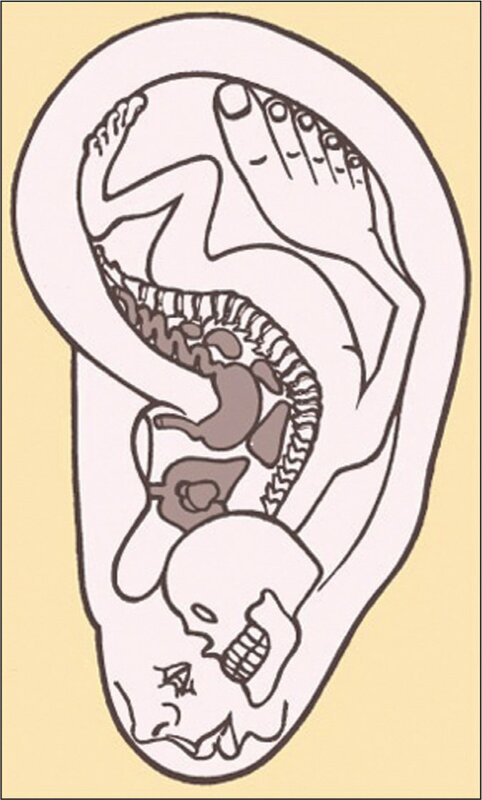 The external auricle maps a homunculus, a pictorial representation of an inverted body. Image courtesy of Joseph M. Helms, MD, FAAMA. Just as the auricular zones allow the acupuncture needles to influence the mesodermal tissue of traumatized muscles, they also provide access to ectodermal, intracranial structures. For this reason, needling a combination of 5 points that influence the cingulate cortex and thalamic nuclei is being promoted anecdotally among military physicians, midlevel providers, and medics as a first-line treatment for acute pain. This collection of points has been named the “battlefield acupuncture” combination. In our clinical experience, a pattern of 6 auricular points that influence the intracranial structures that process and interpret stress and psychoemotional trauma has shown itself to be of great value in assisting service members to process and repair their psyches, whether the trauma is recent or longstanding. This collection of points is called the auricular trauma protocol or ATP. While serving in Afghanistan, this article’s co-author Robert L. Koffman, MD, MPH, cared for numerous patients with psycho-emotional injuries. The care of 3 such patients involved in an improvised explosive device (IED) explosion that had killed several of their fellow soldiers illustrates the contribution of medical acupuncture in their recovery. Post-blast, all were experiencing pounding, mild traumatic brain injury (mTBI)-related headaches and assorted musculoskeletal injuries. With a profound sense of loss and overwhelming grief, all were angry about the death of their friends. Upon arrival to the BAS, the soldiers were placed on cots, 3 abreast. Each had the combination of 6 needles inserted. The needles were removed after 20 minutes, each soldier reporting that after their acupuncture treatment, their headaches had decreased and that there was significantly reduced pain associated with soft tissue injuries. Most importantly, from a psycho-emotional perspective, each soldier reported a state of calm and relaxation that none of them had experienced since well before the blast. In our clinical experience, similar results are reliably observed whether treatments are provided immediately following acute trauma or when symptoms persist, such as those seen after the diagnosis of PTSD is made months or years later. Another case illustrates how the 6 zones needled at ATP points stimulate a clearing process that allows traumatized patients to experience some psychological detachment from the intensity of their memories. In a military population, this is often the first nonpharmaceutical experience of relief from torment. A 33-year-old Marine was medically retired 7 years before receiving acupuncture treatments. He suffered crush injuries to both wrists from landing on outstretched arms after being catapulted from an armored vehicle when it plunged into a crater created by an IED. In addition to the pain and restriction in movement he had from damaged bones, metal plates surgically inserted into his wrists, and surgical scars, he stated with a flat affect that most days he just did not care about what happened next in his life. He was provided local treatment to the damaged extremities at the initial acupuncture session, to which were added the ATP points. At his follow-up interview, he reported that he had slept for 7 consecutive hours the night after the treatment, which was the longest sleep he had experienced since his injury. He also said that his apathy had notably decreased, and that he was looking forward to what the next 6 months would bring. Similar bimonthly visits over 6 months reduced his extremity pain to a manageable discomfort without pain medications, and transformed his hypervigilant, irritable, suicidal state to a calm, focused, and reintegrated husband, father, and veteran. He describes how in his pre-treatment psyche, he was unable to isolate the events and suffering of the previous 7 years into a mental compartment that allowed him to lead a rational and predictable life. The auricular treatments facilitated a more healthy and adaptive compartmentalization of his trauma, allowing his psyche to process his traumas in a less affect-laden manner. In a third case, a young enlisted man, seen in the combat theater of Afghanistan by co-author Koffman, was weary from months of sustained battlefield operations. He presented with typical Criterion “B” symptoms of PTSD — intrusive recollections, and Criterion “C” symptoms of hyper-arousal. With a chief complaint of “I just can’t sleep” (perhaps the most common complaint from a psychiatric perspective), the individual had already been prescribed the usual course of trazodone (5-HT2A receptor antagonist) and the nonbenzodiazepine sleep agent, zolipidem. At doses considered to be safe for use in the unpredictable setting of combat, both agents only provided temporary relief of insomnia. Like many soldiers, although this recruit was well aware of his psychic angst, he was not particularly interested in seeing Dr. Koffman, dubbed “The Wizard” by the soldiers because of the belief that he could make soldiers vanish, eg, disappear through medical evacuation (medevac). The patient’s situation was a classic case of combat/operational stress reaction (COSR). Functionally equivalent to acute stress disorder (ASD), by employing the BICEPS principle (brevity, immediacy centrality, expectancy, and simplicity) the operational psychiatrist offers respite and relief for COSR, and works hard to keep warriors with their unit. Should conservative treatment fail, more definitive interventions in accordance with established clinical practice guidelines are required. Separation from a soldier’s support system, including his fellow troops, is to be avoided at all costs,6 according to prevailing military philosophy. Not only would medevac or clinical confinement exacerbate the shame associated with perceived failure, but also would contribute to a soldier’s sense of having abandoned his men and his mission. The patient was informed acupuncture could aid sleep, help restore his psycho-emotional balance, and produce a state of calm. He agreed to the treatment. Indeed, this author finds that many service members choose to undergo acupuncture, if only for “bragging rights” to their buddies about being “stuck” with needles, or to boast via email to family members back home. After 20 minutes, the patient reported experiencing unexpected levels of relaxation with the subjective relief of his anxiety down from a 6 to a 1 on a scale of 1 to 10. Upon follow-up the next day, the patient reported “solid sleep” for the first time in months. The soldier agreed to a subsequent procedure known as “Seven Dragons for Seven Demons.” The indications for this procedure were his symptoms of hyper-arousal, anger, and avoidance. With this technique, well-referenced in Chinese medical literature, the need for the psychotherapist to develop a trusting relationship with his or her patient cannot be overstated since there is hope — if not anticipation that this treatment can hasten emotional release, and promote psycho-emotional healing. Considering that members wounded in combat not only suffer physical and psychological pain, but also often experience perplexing sequelae resulting from existential conundrum (also known as “moral injury”), the psychiatrist equipped to render acute care using an integrated approach to acupuncture and psychotherapy has the opportunity to parlay that trust into a deeper psychological discussion of the meaning of loss and despair. This can help to uncover cognitive distortions, and work toward recovery and restoration. This can be facilitated in 2 ways: the clinician’s having demonstrated the efficacy to reduce pain and suffering through the initial acupuncture treatment; and upon removing the needles, when asking if the patient would like to share thoughts and feeling that occurred during the procedure. Indeed, as if to be revelatory, in an unexpected moment of insight following Seven Dragons therapy, the patient asked, “Why do I keep pushing [people I love] away?” What followed was a meaningful psychotherapeutic session that dealt appropriately with loss, even more so with anticipated or feared loss. Several types of acupuncture are useful in combat situations, as well as in clinical settings. Key to the discussion is the realization that service members want — and demand — choices when it comes to the care of wounds sustained on a battlefield, particularly wounds of a psychological nature. While medications remain the primary treatment, pharmacotherapy is sometimes prohibited by the combat situation or is eschewed by the patient. Our clinical and field experience has shown us, once engaged and empowered, service members perceive a victory of sorts over ever-present psychological stigma. To battle with the “Wizard,” if only for the opportunity to “Come for the needles; stay for the therapy,” is clearly a win-win for the service member and for the provider alike. Rand Corporation. One In Five Iraq and Afghanistan Veterans Suffer from PTSD or Major Depression. Available at: www.rand.org/news/press/2008/04/17.html. Accessed April 25, 2013. Hoge CW, Castro CA, Messer SC, McGurk D, Cotting DI, Koffman RL. Combat duty in Iraq and Afghanistan, mental health problems, and barriers to care. N Engl J Med. 2004;351:13–22 doi:10.1056/NEJMoa040603 [CrossRef] . Joca SR, Ferreira FR, Guimarães FS. Modulation of stress consequences by hippocampal monoaminergic, glutamatergic and nitrergic neurotransmitter systems. Stress. 2007;10(3):227–249 doi:10.1080/10253890701223130 [CrossRef] . Gurvits TV, Shenton ME, Hokama H, et al. Magnetic resonance imaging study of hippocampal volume in chronic, combat-related posttraumatic stress disorder. Biol Psychiatry. 1996;40(11):1091–1099 doi:10.1016/S0006-3223(96)00229-6 [CrossRef] . Yehuda R. Biology of posttraumatic stress disorder. J Clin Psychiatry. 2001;62(Suppl 17):41–46. Green BL, Grace MC, Lindy JD, Gleser GC, Leonard A. Risk factors for PTSD and other diagnoses in a general sample of Vietnam veterans. Am J Psychiatry. 1990;147(6):729–733. Robert L. Koffman, MD, MPH, is Department Chief for Clinical Operations at the National Intrepid Center of Excellence, Bethesda, MD. Joseph M. Helms, MD, is President, Helms Medical Institute, Berkeley, CA; and Founding President, American Academy of Medical Acupuncture. Address correspondence to: Robert L. Koffman, MD, MPH, National Intrepid Center of Excellence, 8901 Wisconsin Avenue, Building 51, Bethesda, MD 20889; email: Robert.L.Koffman.mil@health.mil.